Chris Hughton calls Brighton's draw with Leicester an opportunity missed after the away side played most of the game with 10 men after James Maddison's red card. 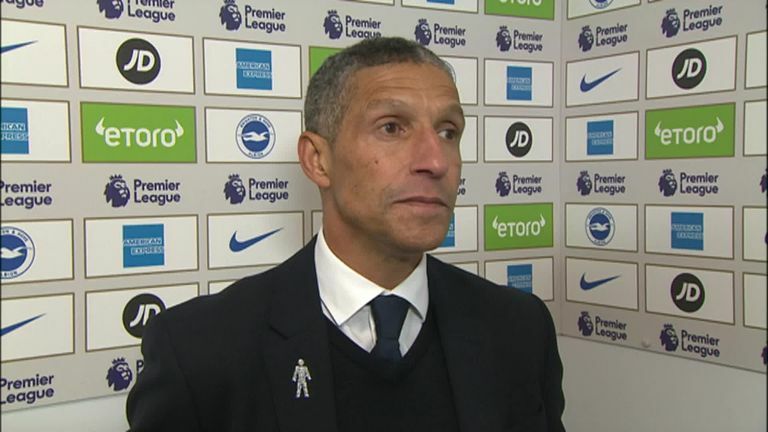 Chris Hughton described Brighton's match with Leicester as a 'missed opportunity' after seeing his side blow one-goal and one-man advantages to draw 1-1. The home side dictated much of the first half and took an early lead through Glenn Murray's seventh Premier League goal of the season after 15 minutes. James Maddison was sent off for Leicester soon afterwards but, despite the former champions playing more than an hour with 10 players, they came back through Jamie Vardy's penalty to take a point. Hughton said: "We had a good start. I thought we were good in that first half period and particularly good against 11 men. "I thought we had ample opportunities to increase that lead. We got into good areas - no real clear chances, but we got into so many good areas. "We probably got into more good positions in that final third than we have done in any of our home games this season. Particularly against 10 men, you've got to make that count. "Against good sides with pace, they're going to be strong on the counter and you've got to be able to kill the game off. We weren't able to do that. "Of course, the longer the game goes against a team of their quality - even when they were down to 10 men - they were going to be a threat on the counter attack. "It's a poor penalty we've conceded and it's a really good opportunity missed." In the build-up to winning their penalty, there were suggestions of offside when Kelechi Iheanacho came into play after Jonny Evans had been blocked by Beram Kayal. Israel midfielder Kayal then brought Iheanacho down, giving Vardy the chance to convert, but Hughton had no complaints in that respect. "Maybe that was the case, I don't know," he said. "But regarding the actual contact on the penalty, I've no problems with that. "By that stage, we shouldn't have been putting ourselves in that type of danger. We had really good opportunities in that final third to increase our lead. "That would have made life easier but the longer the game went on… they're a very good side with a lot of pace and they can make really good changes."